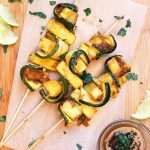 Make your summer bbqs healthier by offering this veggie skewer option of pineapple and zucchini grilled with a sweet golden bbq glaze! It’s currently summer here in Australia and a lot of social gatherings around this time of year revolve around a barbeque. It’s always a great time with family and friends, spent outdoors playing, laughing and eating. However, there is typically a lot of meat served, including steaks, sausages, ribs, rissoles, cold meats and more… and this is usually all available at just one bbq. 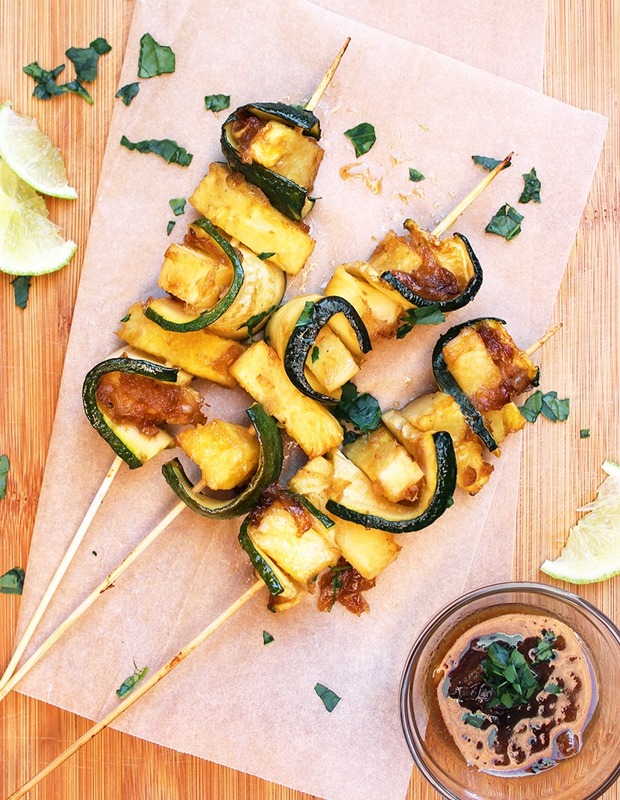 So, in an effort to offer more bbq-friendly veggie recipes to anyone who is looking to bring something meat-free along next time; I’ve created these Australia-themed pineapple & zucchini skewers with a bbq glaze. The scrumptious golden bbq glaze is super easy to whip up and is made using only 7 ingredients. I absolutely recommend making double the glaze recipe and using it as a sauce on your other veggies as well. It’s sweet, tangy and tasty! If you’re interested in more bbq-friendly veggie recipes, check out these walnut veggie burgers and this curry roasted cauliflower. If you make this recipe, share your pics with me on Instagram, just tag me @lemonthy.me, I love to see your recreations! Also feel free, as always, to leave any questions, comments or suggestions below. Either pre-heat your oven to 200°C (390°F) if using an oven to cook these. Heat a small amount of oil in a frying pan over medium heat, chop the onion and garlic and add them to the pan. Once the onion is translucent, turn the heat to low. Add the rest of the glaze ingredients into a small bowl and whisk, then add to the frying pan and stir until it starts to simmer. Remove from the heat and set it aside to cool. Chop the fresh pineapple into small chunks and slice the zucchini, first in half widthways and then into thin slices long ways. 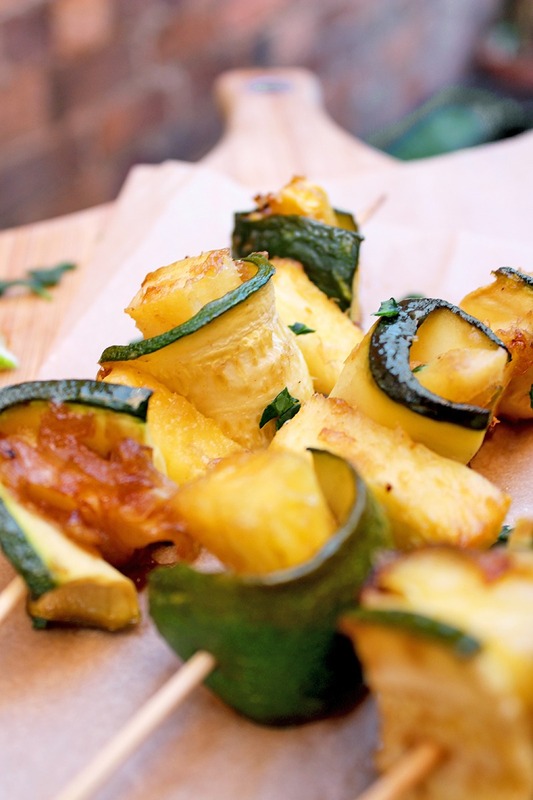 Arrange your pineapple and zucchini onto the skewers and place them onto a foil lined tray, or, if using a barbeque, onto a sheet of foil with the sides rolled up. 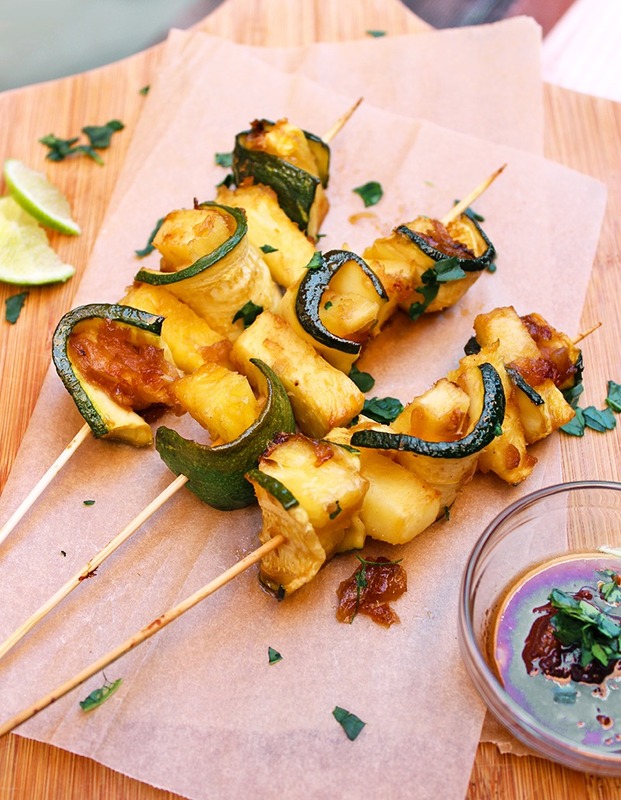 Blend the cooled sauce mixture in a blender and pour it over the skewers. Add them to the oven for 20 minutes, turning them halfway through. If using a barbeque, add the foil “tray” with the skewers to the grill, regularly turning them until they’re well cooked. Sign me up to the LemonThyme newsletter please. Hello, I'm Kayla. I create easy and fun Vegan Recipes that are a good balance of healthy and delicious. Besides being in the kitchen, I love a good book, gardening and beach days. © 2019 LemonThyme. All Rights Reserved.